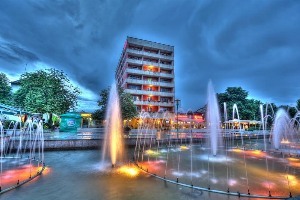 The town of Sandanski is 166 km to the south of Sofia; it lies on the southern slopes of the Pirin mountain range, on the bank of the Sandanski-Bistritsa river. Bioclimatic characteristic: the average height above the sea level is 224 meters, the average annual air temperature is plus 14,7˚ С, the relative air humidity is 66%, the average annual precipitation is 534 mm, the sunshine duration is more than 2450 hours a year. 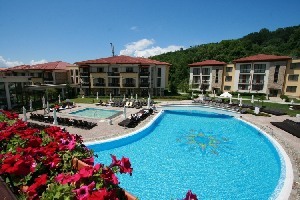 Perfect airing and security from the northerly winds are typical for the resort. There is no industrial pollution in Sandanski. There is a vast park in the town with the marvellous opportunity for hiking and mountainous passages in Pirin. The Mediterranean influence is strongly pronounced in the climate of Sandanski; it presents a complex of exceptionally favourable bioclimatic constants. From the earliest times the healing mineral springs in the town enjoy wide popularity. The mineral water of Sandanski are transparent, colourless, with no smell, with pleasing savour; they are hyperthermal (from 42 to 81˚ С), with low mineralization, more or less uniform in chemical composition – hydrocarbonate, sodium sulphate, with neutral to with a light alkaline reaction, rich in fluorine and metasilicic acid. The medicinal properties of the mineral water are used in the water therapy programs for musculoskeletal diseases, central and peripheral nervous system, gynaecological problems. These waters are medically justified for drinking according to a doctor’s scheme as a therapy for gastrointestinal disturbances. 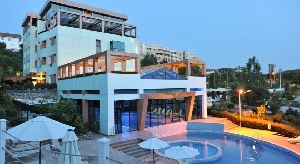 The unique climate, the unbelievable purity of air and the absolute absence of allergens make the resort especially suitable for prevention and treatment of the upper air passages and bronchial asthma. According to the scientific researches, the percentage of amelioration of all forms of bronchial asthma during any season of the year is considerable. The atopic form is the most successful to cure, it is followed by the mixed infection allergic asthma. The season and the form of the bronchial asthma influences the treatment response. The best effect in atopic asthma cure is produced by spa treatment in autumn – 96,7% and the lowest in summer – 86,8%, the best response in infection allergic bronchial asthma treatment is attained in summer – 99.3% and the lowest in spring – 79,1%; in mixed form treatment the highest response is in autumn – 92,6% and the lowest in spring – 76%. The scientific research in the sphere of remote treatment results and the observations on the patients who moved in to the resort give all grounds to state that the optimal duration of treatment of chronic non-specific respiratory apparatus diseases is about 30 days. The obtain a relatively long clinical remission among the patients with severe forms of the disease, the treatment should continue from 3 to 6 months. · chronic pneumonia, rhinitis, pharyngitis, etc.). · peripheral nervous system diseases. · dermatological diseases of allergic character. · urinary excretion system diseases. · gastrointestinal tract, liver and biliary tracts diseases. · post fracture conditions – slow healing bones fractures. · climate therapy (aerotherapy, heliotherapy). · kinetotherapy (physiotherapy exercises, respiratory gymnastics, massage). · medicative herbs infusion and medicines). · phytotherapy (traditional Bulgarian treatment with use of vulnerary plants). · acid, compressed air, electrogalvanic baths). · tuberculosis in open form. · essential hypertension on decompensation stage. · caused by long-term care with corticostroids.